Gifts of wheelchair and toilets make a world of difference to children with disability. “It was until last year, that I had to use a wooden stick to go to school. Most of the time, my mother had to carry me everywhere. But I’m very happy that I have this wheelchair now,” says 12-year-old Palak. Palak is a spirited, young girl from a small village in Unnao, Uttar Pradesh. She lives with her grandmother Vidyavati, mother Sunita and three siblings, Raj, Rithik and Payal. 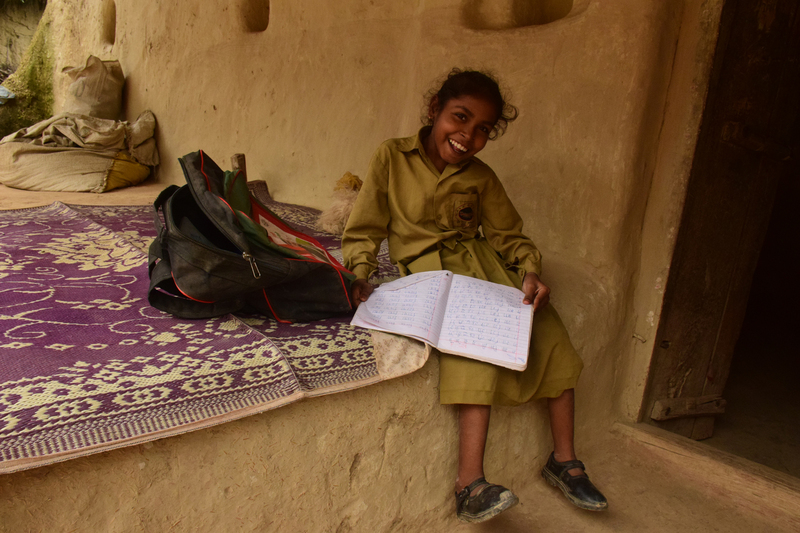 Palak is currently studying in class 6 and dreams of becoming a doctor someday. “I want to be able to treat people and help them,” says Palak. “Even when my sponsor asks me in the letters, I tell them that I want to become a doctor. My sponsor enquires a lot about me in the letters. I feel special that someone is so concerned about my health and well-being. We remember receiving gifts like a sewing machine, gas chulha and cupboard from my sponsor,” says Palak. Palak was born with a physical disability. Her hips weren’t strong enough. Her parents took her to various doctors, but nothing could be done. “I’ve to help her with most things around the house and outside as well. But she’s a very understanding girl as she knows that I have to look after her siblings as well. She tries to help me in small ways. She’s also very smart and I’m happy that she studies on her own,” says her mother Sunita. Palak’s father works as a shopkeeper in Punjab and visits them only twice or thrice in a year. But he is very attached to his daughters. Not a day goes by that he doesn’t speak to them over the phone. “He can come only in January and during summer to see us, that’s why I miss him a lot,” says Palak, her eyes brimming with tears. “This wheelchair has really been a big gift for me,” says Palak. “It feels so nice to be able to move faster and to be on my own.” Moreover, her house was provided with a toilet, as part of World Vision India’s work to address the issue of open defecation. “I am grateful that we have toilets in our village. 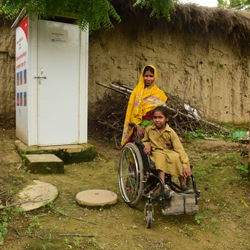 Palak is also growing up and so this toilet has come at the right time,” says Sunita. “Because we have a toilet at home, my children are free to relieve themselves whenever they want to. I don’t have to always accompany them or worry about their safety. It was very difficult and uncomfortable for me to take Palak far away, so she used to use the courtyard of our house to relieve herself. I didn’t realise that this was also affecting our general health. Now that we have our own toilet, I no longer have to worry about these things. It is a big relief! I am very happy because now my children fall sick less often and they have been trained to wash their hands immediately,” says Sunita cheerfully. I wish to know the cost of wheel chair and the cost of toilet. Hi Janakiraman, thanks for writing in. The toilet costed Rs. 23,500 and the wheelchair costed Rs. 15,680. I would like to donate a wheelchair or a toilet but I don’t see these in the list of gifts on the website. Can you tell me how I can indicate that my donation is specifically for this purpose? Please note that Real Gifts (realgifts.worldvision.in) is World Vision India’s crowdfunding platform where people can choose a need and gift according to their budget. All gifts are chosen by our staff who work in the community and they reflect the real and urgent needs of children and their families in the communities.